This bike was built up as a replacement to my Woodrup (see below). It is tastefully highlighted in orange both for aesthetic appeal and for safety on the road. Frame: OnOne Pompino steel frame, originally in white. Powdercoated matt black by Armourtex Ltd. Wheels: Custom built Velocity Deep-V rims against Shimano Deore XT front hubs, handbuilt by my friend Phil. Brakes: Avid Single Digit 7 callipers wired to Avid Speed Dial 7 levers. Drive Train: Pro-Lite Sardinia Track Chainset - 46T. The rear hub has been reversed and uses the kit from Velosolo with an 18T cog attached directly onto the disc brake mount. Bike to Human Interface: Kore platform pedals. I sanded down some of the nubs in order to fit them with shoe traps for a very unique look and some very supporting pedals. 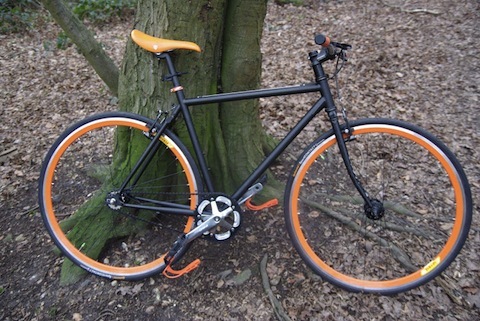 Orange 'Fly' saddle which was probably a bad choice of colour! Handlebars & Stem: 60mm Quest stem because I have short arms. Cane Creek S1 headset, cheap and cheerful. 650mm handlebars from Cycleopedia's stock room with 3cm sawed off each end. Frame: The frame is a cyclocross frame, roughly equivalent to a standard 54cm frame. In addition, I opted for a brushed finish and wishbone chainstays. When getting the bicycle fit, I opted for a more upright seating position for increased comfort over long distance. Fork: A broken fork would be a disappointing show stopper! Originally a Surly Crosscheck fork which I used on the Tour D'Afrique (a broken fork would be a disappointing show stopper!). Currently a carbon Kinesis Pro cyclocross fork. Wheels: The wheels are handbuilt 700c wheels composed of road rims and mountain bike hubs. The were built using Hope Pro3 hubs (in anodized red) and Mavic Open Pro 36 spoke rims. In retrospect, wider rims would have been preferable but we'll see how these fare. Brakes: Since I decided to go against using STI levers, we elected to use Cane Creek V-Brake levers which allow the use of more powerful V-brakes (versus the cantilever brakes usually found on cyclocross bikes). These are wired to Avid Single Digit 7 callipers using Kool Stop Mountain Dual Compound pads and Fibrax braided stainless steel cables. They are INSANELY powerful compared to the cantilever brakes I am used to. These will be the cause of some injury, no doubt. Drive Train: This was largely cloned from the Specialized TriCross Comp for simplicity reasons. Shimano 105 front and rear derailleurs are coupled to Dura Ace bar end shifters. The chain set is a Truvativ Elita compact double (50-34t), running with a 12-25 Shimano 105 cassette. I'll be using SRAM 1050 chains since Powerlinks are very useful. Tyres: Tyres were a difficult choice, mainly because of the varying road conditions we are expected to meet. I will take three sets of tyres, one set of slick road tyres (Schwalbe Marathon Road), another medium set of touring tyres (Schwalbe Marathon) and a heavier set for off-road (Schwalbe Marathon Extreme). 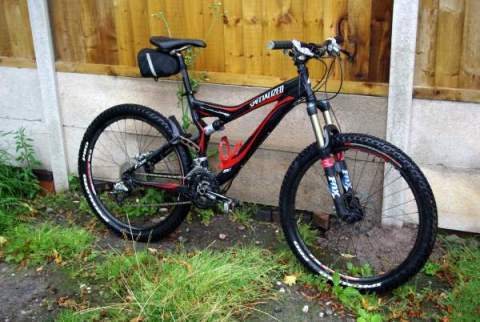 My first nice mountain bike. Everything is still mostly stock although I keep planning to change the brakes to something that is !Avid - these are terrible and continuously jam up. I've had the rear shock serviced by Mojo Suspension Hoodoo and it works a treat (as new). Bought second hand off Gumtree, a genuine 1980s steel framed tourer. As Phil and I waited for the seller, we wondered why it would be so cheap if it was equipped to the same specification that had been advertised. We joked that it was probably in bright pink or a similarly garish colour. 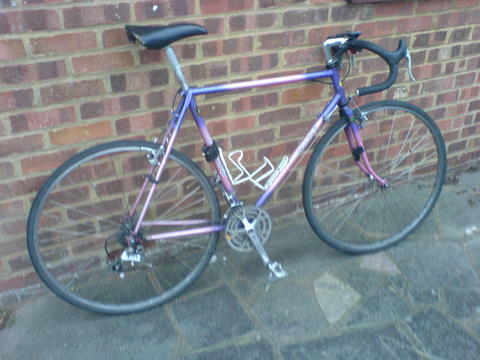 Sure enough, as the seller rounded the corner, he wheeled to his side a bright purple and pink road bike... 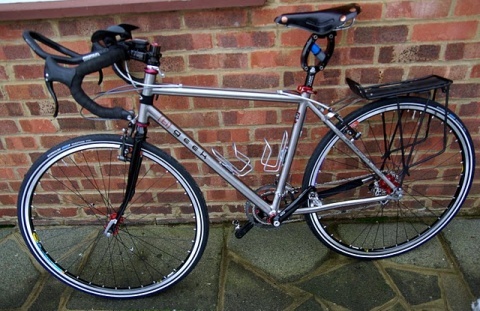 This had a Reynolds 531 steel tubing, a Shimano double crankset, downtube shifters and cantilever brakes. I once used it in a cyclocross race with knobbly tyres. This bike was my premier mode of transport around town and university for five years until getting destroyed in an unfortunate accident. This was my first road bike, bought new from eBay. Nothing special about it except that it was much too big for me. 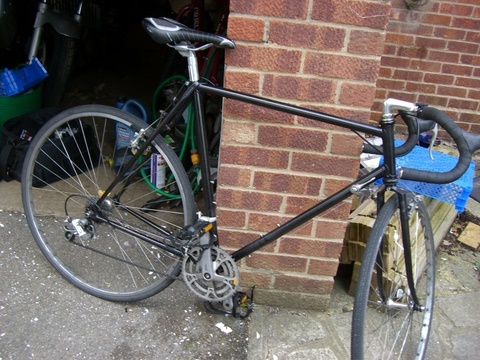 This was the first bike I used to use to commute into London, and was knocked off twice while commuting home in the evening (on two separate days)! I eventually sold this in order to raise funds to buy the Stumpy above. 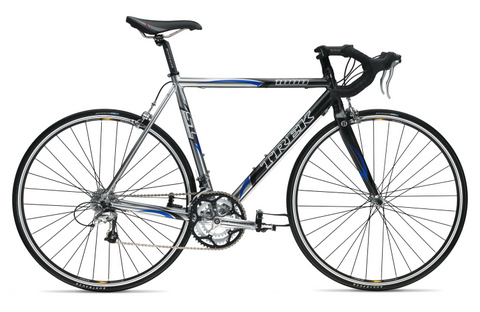 This was the bike that got me so passionate about cycling. Bought after my cheap dual suspension mountain bike was stolen at work one summer, I started commuting to school on it and consequently lost a >lot< of weight over the following four years. 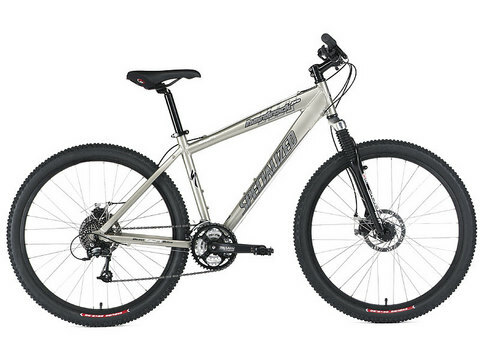 I rode this bike everywhere, and must have replaced nearly every component on it before finally upgrading to the Stumpy. The last I saw of this was at Cycleopedia in Watford when someone stole it from the back of their shop - a devastating loss of something sentimentally dear to me.